Louisiana – Where is Ruthi? It is impossible to simply walk down Bourbon Street in New Orleans. The music emitting from the buildings and the sounds of the street require one to dance. Or move your body in tune with the rhythms. Or, at the very least, tap your feet. Culture is its heart; heritage is its blood; and music is the very soul of the city. Hidden behind Cafe du Monde is a secret little place where you can get your groove on. No, it is not a brothel. The New Orleans Jazz National Historical Park celebrates the history of New Orleans jazz, the musicians who created the spontaneous improvisational music movement, and the cultural heritage of a lively, yet laid-back city. 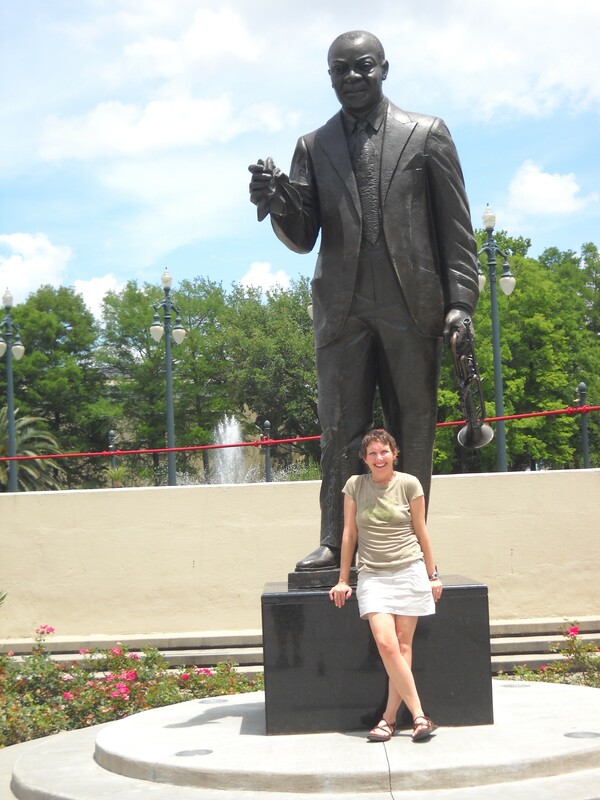 Experiencing the park is an immersion into New Orleans jazz. The visitor center on Peters St. has a small gift shop; but few exhibits. The park offers several opportunities to actively learn about the musical development of the city. First, I sign up for a one-hour guided walking tour. Walking tours are offered twice a week and are free. The tour begins at the visitor center with a brief introduction; then continues with a stroll around Cafe du Monde, through the French Market, and ending at the Old Mint. The guide stops several times to explain the influence of various cultures on the development of New Orleans jazz. 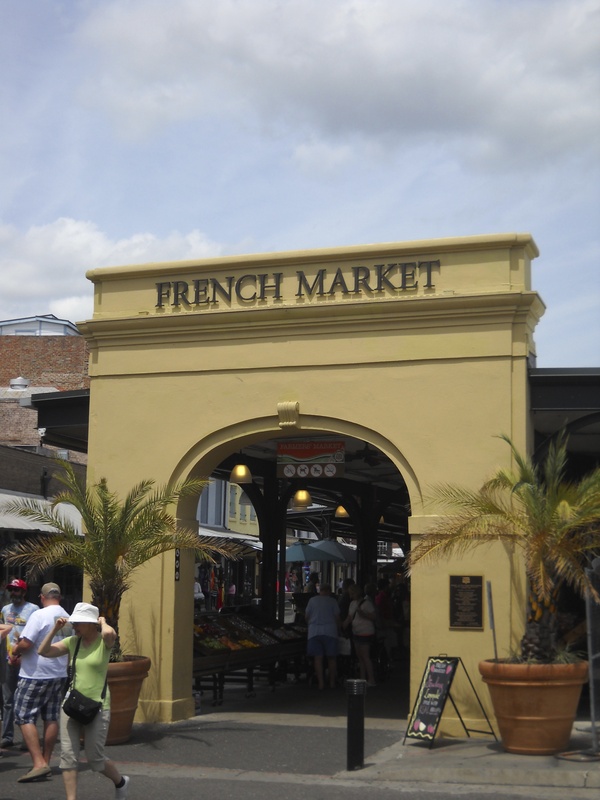 France founded Louisiana as a colony in 1699 and New Orleans was settled in the early 1700s. In 1803, after a brief episode where Spain ruled (1763 to 1800), the U.S. bought the colony. After the Louisiana Purchase, immigrants poured in from the southern states bringing with them their African slaves. New Orleans quickly became a world port as immigrants from Germany, Italy, and Ireland also settled in Louisiana. New Orleans’ proximity to the Caribbean Islands of the West Indies, its strongly French background, and a tolerance towards ethnic differences, created a “perfect storm” for an emergence of a unique fusion of diversity. This blending of European, African, and Caribbean cultures can be seen in New Orleans cuisine, spiritual beliefs, architecture, language, and especially, music. Concert venues abound in NOLA. Preservation Hall and Tipitinas are great places for evening shows. However, two or three afternoons a week, the New Orleans Jazz National Historical Park hosts a free concert in the Old Mint. The guided walking tour ends at the Old Mint as the concert begins. I enjoy the interactive concert; sometimes singing along with the crowd to a familiar quick-tempo tune, other times closing my eyes and simply listening as the piano sounds and the pianist’s soft lyrical voice washes over me. The semi-secret concert is a wonderful, pleasurable, intimate surprise. Next time you are in New Orleans, check out the Jazz Historical Park’s website for the concert schedule. The National Historical Park also provides a walking map of the French Quarter. The self-guided tour includes cell phone stops where I use my own cell phone to call a posted number and listen to a recorded message describing the site. The entire tour takes about three hours, depending on how long is spent at each site. 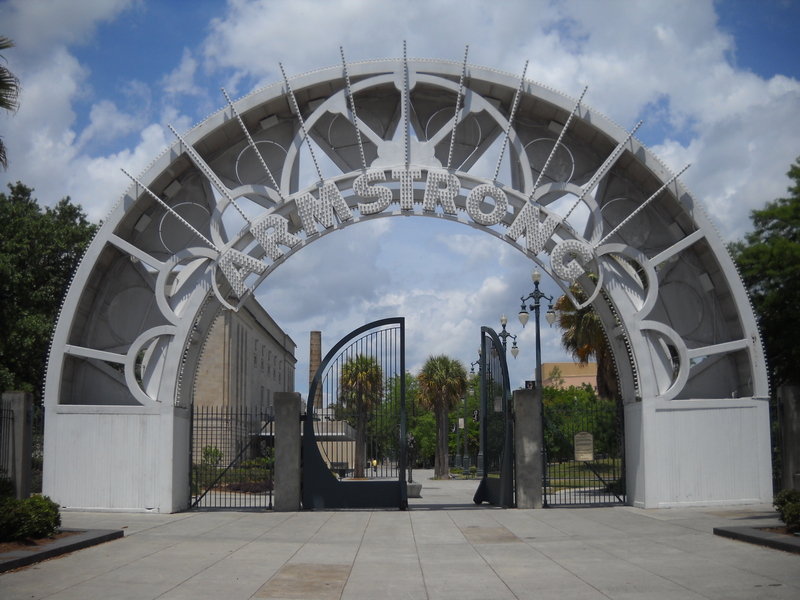 The route passes through Armstrong Park and includes a very good description of Congo Square and the influence of African slave traditions on the early developing music scene. From the mid-1700s, Sunday was a “free day” for slaves in New Orleans. Hundreds of slaves would gather in Congo Square to trade, fellowship, and dance. The Sunday celebrations ended with the start of the Civil War but the sounds, beats, and rhythms of Congo Square still linger in the musical heritage of New Orleans. 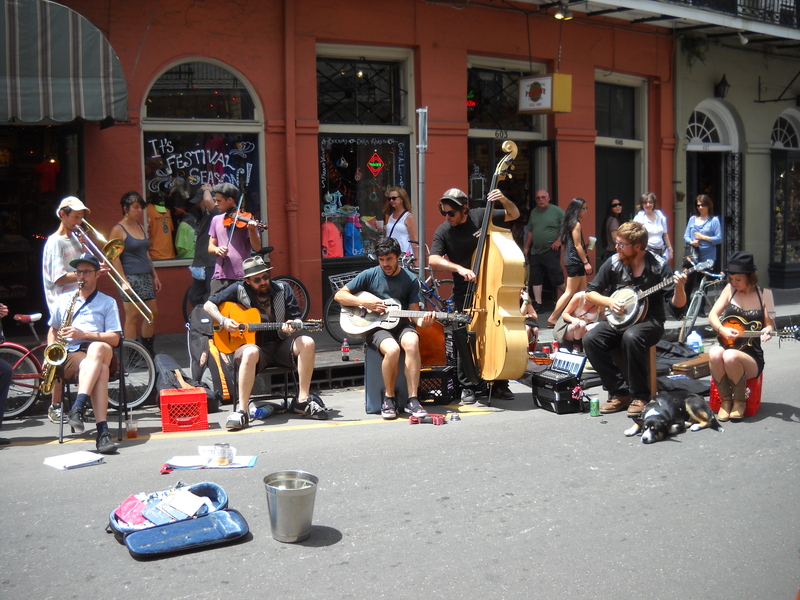 The distinctively improvisational style of NOLA jazz is best experienced in the French Quarter. Any time of day or night, street musicians play a variety of instruments entertaining those who stop to listen. As I’m walking the self-guided tour route, I stumble across a large group of musicians playing everything from a string bass to a ding bell that was removed from a hotel desk. One musician begins a song, and slowly the others join in the rhythms. The amazing thing is that between songs, they introduce themselves to each other. I am lucky to witness an improvisational gathering of fantastically talented musicians that sound like they have been playing together for years. Amazing! I linger for at least an hour, enjoying the music so much that I forgot to take video and almost forgot to take pictures. 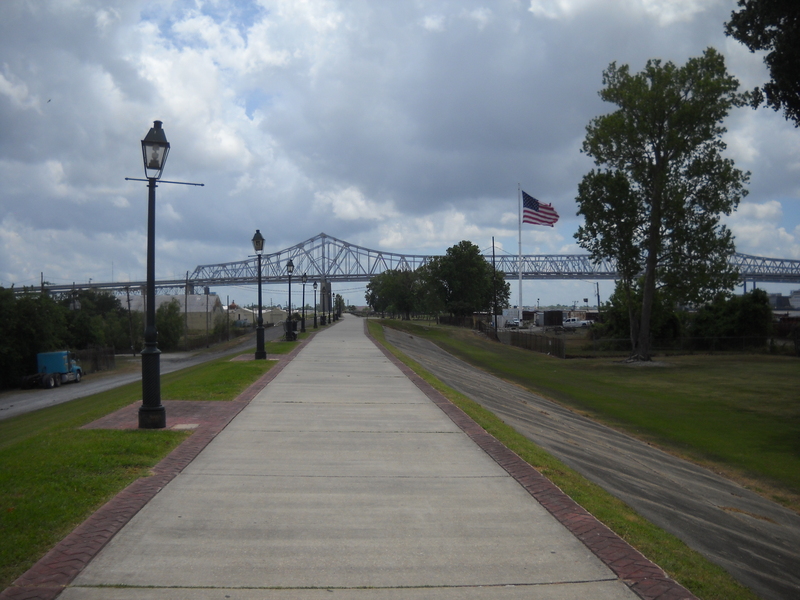 A Jazz Walk of Fame is located a short ferry ride across the Mississippi River. Sixteen numbered lampposts line the Algiers Ferry Landing, each representing a musician who influenced New Orleans jazz. Louis Armstrong, Al Hirt, Sidney Bechet, Buddy Bolden, Danny Barker, Jelly Roll Morton, Joseph “King” Oliver and many other musical greats all called New Orleans home. The Jazz Walk of Fame is a cell phone narrated walk and I am very disappointed that most of the placards indicating the musician and their number are missing. I listen to the few narrations that are represented, take a few pictures, and ride the ferry back across the river.